Toddler sleeping bags are so cute! Some come in child-friendly designs. Others look like miniature adult sleeping bags. These bags are fun to have - but if you are planning to use these on a camping trip, be sure that you are getting a real sleeping bag. Many toddler bags are designed for indoor sleepovers, not for camping. Camping with toddlers is fun! Toddlers are enthusiastic about everything. They are learning and exploring all day long. Seeing the world through their eyes can be magical. Camping with toddlers also presents some challenges. One of the biggest challenges comes at the end of the day, when it's time to put them to bed. Getting toddlers into bed and to sleep, and keeping them warm in bed can be daunting. Is a toddler sleeping bag the solution? Maybe. Most sleeping bags designed for toddlers are not warm enough for real camping - and some toddlers just won't stay in a bag. Don't worry, though: there are lots of other sleep solutions for toddlers if you decide that a mini sleeping bag isn't the right choice for your family. It's hard to resist miniature camping equipment - especially when you picture your sweet little one using it! 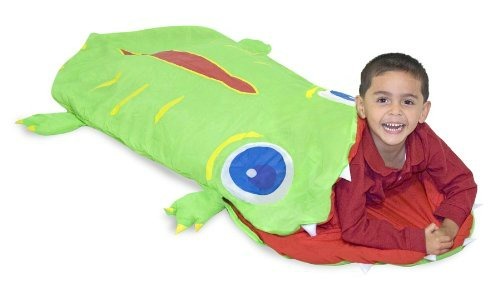 Your child would probably like to have his or her own sleeping bag. 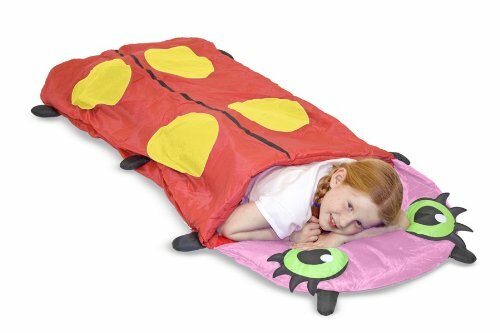 Your child might even go to bed more willingly in a special little sleeping bag. The sleeping bag can be used at home. A sleeping bag is handy for naptimes, for cuddling on the couch with a book, or for pretending to go camping. It's the perfect thing to take to a sleepover at Grandma's house! These bags are ideal for indoor use. A toddler sleeping bag has a very short life. A toddler bag will be used just for one or two seasons before being outgrown. If you are planning to have more than one child, you can pass the bag down from one to the next. If not, that's a big expense for just one year's use. A good quality bag will be expensive. All children's specialty camping gear is pricey. Don't waste your money on a cheap bag unless it will be used only indoors. Some higher priced toddler sleeping bags are expandable, so that they grow with your child. You'll have to decide whether that justifies the higher price. The child might not stay in the bag. Many toddlers are wigglers. They don't stay under their blankets at home, and of course they don't stay neatly tucked in their sleeping bag on a camping trip. They may work their way down into the bottom of the bag, or they may wiggle their way completely out of the bag and end up sleeping on the cold ground. I have heard stories of adventurous toddlers getting out of their little sleeping bags in the middle of the night and trying to go exploring while their parents slept! Some toddler sleeping bags have drawstrings that tighten around the shoulders in an attempt to keep the child in the bag. I would be worried about the possibility of the string getting tangled around the child's neck. If you do purchase a toddler sleeping bag with a drawstring, you might want to remove the string. Plan for a wiggly child and dress accordingly. One solution is to use a sleep sack. No matter how wiggly, your little one will stay covered and warm! You could also dress your child in warm layers, including a hooded fleece jacket, and put your child to sleep on a blanket-covered sleeping pad. Cover the child with another blanket. If (or when!) your toddler wiggles out of the nest, the layers of clothing will keep the child warm. Tuck your child in with you. Get two adult-sized sleeping bags that zip together and tuck the child in with the parents. This worked very well for us. I slept soundly, knowing where my child was, and that he was warm and cozy. We coslept at home too, so my children were very used to the arrangement and easily fell asleep in the tent with no fussing. Even families who don't cosleep at home find that this arrangement works well when camping. If you are considering cosleeping, be sure that you know how to do so safely. Some families tie or sew off the bottom half of an adult bag to make it the right length for their toddlers. Others use youth sleeping bags and do the same thing. This money-saving solution might leave you with a cold, miserable child. Sleeping bags keep us warm because our bodies heat the air inside the bags. The better the fit, the warmer the sleeper. Even if you adjust the length, a bag that is too wide will contain big pockets of cold air. Which is the best toddler sleeping bag? 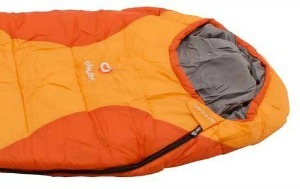 If you decide that your child would do well in a sleeping bag, I recommend the Deuter Little Star. Here's my favorite feature: it's expandable! Keep the foot bag zippered up when your child is small. When your child has outgrown that length, unzip the foot and get another 12 inches of room! Whichever sleep system you choose, you might want to try sleeping in a tent in the backyard for a night before venturing out on your first family camping trip. Good quality toddler sleeping bags are expensive, and your child might not even stay inside the bag. If you are sure that a sleeping bag would work for your child, be sure to get a real, good quality sleeping bag - not one designed for indoor naps. You can also experiment with some of the other ideas I've mentioned until you find the best sleeping bag solution for your family. Sweet dreams! Now that you know about toddler sleeping bags and their alternatives, you can read about the other types of sleeping bags available. 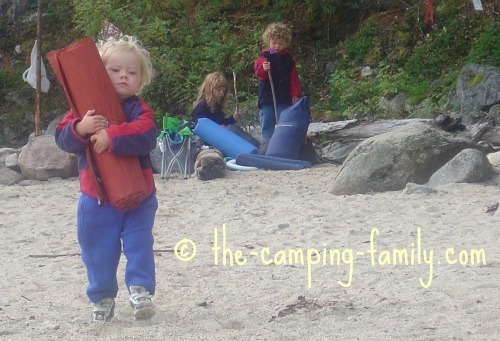 Planning a camping trip with young children? 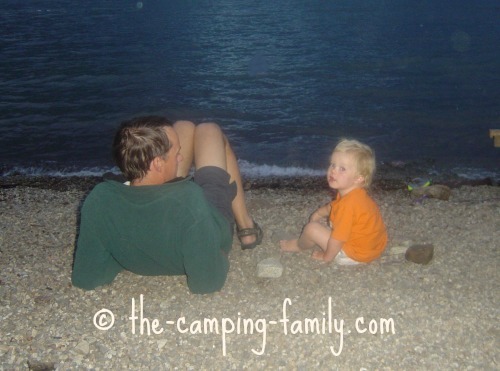 Visit The Camping Family home page for lots of tips.